You are here: Home › HAS 2018 › New to HAS? Here’s What to Expect! New to HAS? Here’s What to Expect! Heartland Apicultural Society (HAS) is a non-profit that works with volunteers to offer three full days of beekeeping education every year, rotating through Midwest and Southeastern states to reach as many beekeepers as possible. 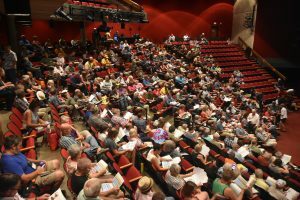 The next HAS annual conference will be held July 8-10, 2019 on the campus of Western Kentucky University in Bowling Green, KY.
HAS offers classes for both beginning beekeepers as well as the more experienced beekeepers looking to update their beekeeping skills. Once the details are finalized, early bird registration will open online with a reduced conference registration price and associated accommodations including meals. Daily walk-ins are welcome during the conference for a daily conference fee. 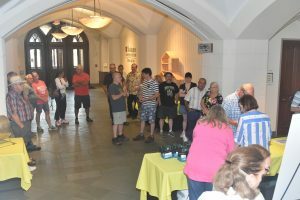 In addition, the conference usually includes a honey show accepting entries in a variety of categories so keep that in mind as you harvest your honey. To get an idea of previous annual conferences, check out posted programs and other history. Each day of HAS annual conferences normally start with everyone meeting in a conference theatre featuring a keynote speaker. 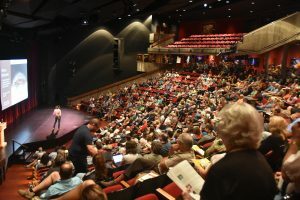 Those sessions are followed by break-out sessions that include classes both in meeting rooms as well as outside in bee yards. A variety of vendors are on hand with a selection of beekeeping products. 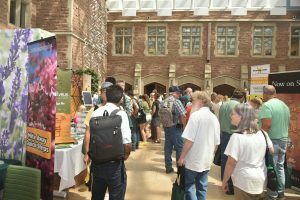 Many HAS attendees take advantage of the opportunity to save on shipping by placing their supply orders in advance to pick up at the conference. Associated activities such as meals and evening events vary from year to year. Conference planners include events that would interest families who may be on vacation with beekeepers attending the session. Dr. Marla Spivak, MacArthur Fellow and Professor at the University of Minnesota, will open the conference with her perspective on how events are shaping the future of beekeeping. Dr. Dennis vanEngelsdorp, Director of the Bee Informed Partnership at the University of Maryland, will provide perspectives on hive management based on his years of collecting and analyzing hive management survey data. Dr. May Berenbaum, Professor and Head of the Entomology Department at the University of Illinois, will address effects of agricultural technology on honey bees. The University of Minnesota Bee Squad, a team of professional beekeeping instructors, will present beekeeping techniques in classrooms and in the bee yard during each breakout session of the conference. 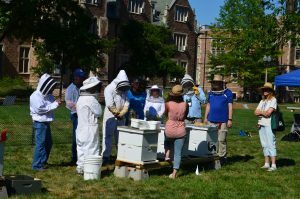 Dr. Keith Delaplane, Professor and Director of the University of Georgia Honey Bee Program, will address the practical challenges of integrating hive management with evolution and ecology, and present classic talks on honey bee biology. Dr. Dewey Caron will present his comprehensives perspectives on the art and science of beekeeping. Dr. Samuel Ramsey from the University of Maryland will present ground-breaking and inspiring research regarding varroa destructor. Jennifer Berry, University of Georgia research Manager, will report on her recent studies of oxalic acid applications. More details will be posted here as they are finalized so check back here to get the latest agenda and related information. Also, sign up for regular HAS email updates delivered to your inbox and follow HAS on Facebook to interact with our organization and other attendees. Have a suggestion for next year’s conference? Let us know!